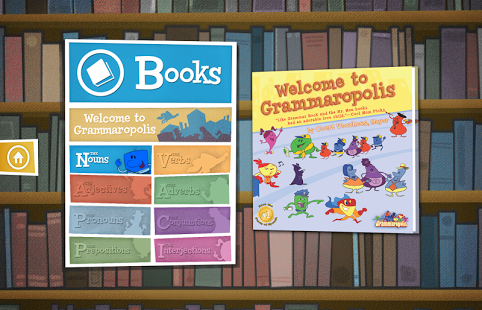 Grammaropolis helps make grammar more engaging. The characters bring each part of speech to life -- there are superhero verbs and artist adjectives -- in a way that gives meaning to its purpose. The app explains each part of speech in depth. Kids learn not only how to identify the parts of speech, but also specific types and relationships between them (for example, transitive and intransitive verbs, subordinating and correlative conjunctions, and more). There are also brief explanations of dependent clauses, punctuating interjections, and other writing structures. 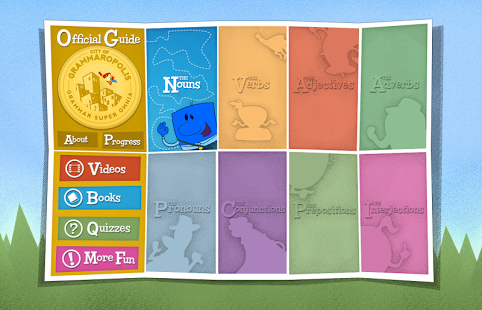 Grammaropolis is a thorough, engaging tool for learning grammar. Grammaropolis is where grammar lives! Hailed as a Schoolhouse Rock for the 21st Century, Grammaropolis uses the parts of speech as animated characters whose personalities are based on the roles they play in the sentence. 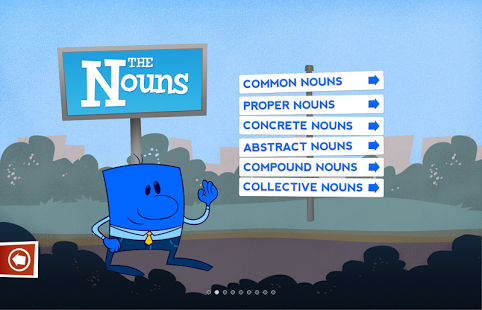 From the shady pronoun always trying to take the noun’s place to the motherly conjunction who just wants everyone to get along, Grammaropolis achieves the impossible: we make learning grammar fun! Follow along as our story based videos guide and teach you through nouns, verbs and other parts of speech. Practice your English language grammar skills with over a hundred quizzes. Every part of speech has its own neighborhood that includes a curriculum map with songs, books, videos, and quizzes. Follow the map to earn your badge! This free app comes with the Noun neighborhood. The remaining parts of speech (Verbs, Adjectives, Adverbs, Pronouns, Conjunctions, Prepositions, Interjections) are available through in-app purchase for $9.99. Grammaropolis was created and refined in the ultimate proving grounds: the classroom. Our innovative, classroom-proven approach blends character-based content with traditional quiz-based assessment and is designed to address students' varied learning styles. Because the parts of speech are personified based on their roles in the sentence, the characterization provides students with a more effective way to visualize and internalize the roles of the parts of speech and to identify how a sentence is put together.